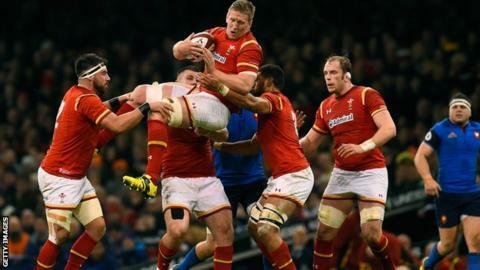 Lock Bradley Davies believes Wales will thrive on the challenge of facing England at Twickenham in a potential Six Nations title decider. England beat Ireland on Saturday to go top of the table with a third straight win, relegating Wales to second place. That has set up a mouthwatering clash between the two unbeaten sides at Twickenham on 12 March. "It's a big challenge for us as a pack, but it's the sort of thing we thrive on," said Wasps second row Davies. "We've got to win the set-piece battle up front, for me up front is where the game is won or lost. "The English pack try to dominate you so we've got to raise the standard again and hopefully take it to them." Davies believes Wales get better as the tournament unfolds. Wales won at Twickenham in the 2015 World Cup as well as recording victories there on the road to their 2008 and 2012 Grand Slams. They are chasing their first back-to-back victories at the home of English rugby since 1978. Davies, 29, made his first start of the Six Nations in the 19-10 win over France following a knee injury to Luke Charteris, having been on the bench for the opening two games. "In our [recent] history, we tend to get better the more weeks we get together," Davies told BBC Wales Sport. "We proved that with a slow start against Ireland, and each week we've improved so hopefully we can do the same at 'HQ'. "It's going to be difficult, but we have been there before and won. "We always believe, wherever we play or whoever we play against, we can beat everyone. We got written off before the [World Cup] game and it was nice to get a win. "People have said a lot about what they [England] didn't do but I think we deserve credit for what we did, we defended well and hung on in there." Davies, who has 52 caps, has plenty of respect for the English second rows after playing with or against them for Wasps in the Aviva Premiership. "I've seen a lot of [Maro Itoje] in the Premiership, he's very good," he added. "George Kruis is a very under-rated player who's starting to get the fruits of that [work] with people starting to recognise how good he is. "Joe Launchbury a club-mate of mine is very good as well. He's world-class when he wants to be, and with Courtney Lawes as well."